Recorded as Brunsden and Brunsdon, this is an English surname. It is locational and derives from a now 'lost' place believed to have been situated in the county of Berkshire. An estimated seven thousand villages and hamlets in the British Isles are known to have disappeared since the 11th Century, due to natural disasters such as the Black Death of 1348, during which an eighth of the population perished, and to the widespread practice of 'clearing' large areas of land for sheep pastures during the boom in the wool trade of the 14th and 15th Centuries. 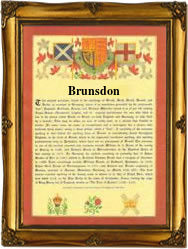 The place called 'Brunsden' or 'Brunsdon' means 'Bruns hill', derived from the Old English pre 7th Century byname 'Brun', the brown one, with 'dun', hill, down, or mountain. The name is found recorded in most of the southern counties of England, particularly Hampshire, Surrey and Berkshire, with the marriage of John Brunsden and Jane Kempe being recorded at Wantage, Berkshire, on August 19th 1655. An earlier recording is that of Thomas Brunsdon who was christened at East Garston, also Berkshire on January 21st 1554. This was during the short reign of Queen Mary of England, 1553 -1558. Throughout the centuries, surnames in every country have continued to "develop" often leading to astonishing variants of the original spelling.